Reiki is an ancient technique for relaxation and accelerated healing. Reiki energy flows through the body to provide deep relaxation and enhancing the body’s natural ability to heal itself. You can learn this simple and easy technique in our upcoming Reiki classes in Mumbai by spending a few hours. Participants experience a nourishment of body, mind and spirit through Reiki. Reiki helps you in natural healing. In the Reiki Level 1 Training you will learn how to use the power of Reiki to heal yourself and other people. There are 3 degrees of Reiki for healing self and others as a Reiki practitioner. Reiki level 1 is about healing at physical level, Reiki level 2 is healing at mental level and Reiki 2 is healing at spiritual level. There is a Reiki Master Degree for those who want to teach others. Certificates are awarded on completion of each level. The Reiki Manual is given to students for reference at the end of the course. 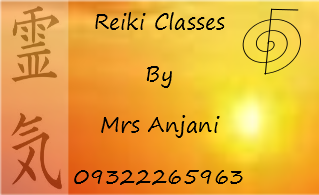 Reiki helps in getting rid of the energy blocks and thereby increasing the energy flow. Reiki helps you grow spiritually and to be strong emotionally. Reiki has been practiced by Millions of people all over the world. Reiki touches all spheres of human life, energizes the body, mind and soul and promotes free flow of energy. You can learn Reiki anywhere in Mumbai in the comfort of your home or at our center in Borivali, Mira Road, Thane and Dahanu. To attend our next Reiki classes in Mumbai, Thane or Navi Mumbai call or WhatsApp me on 9322265963. 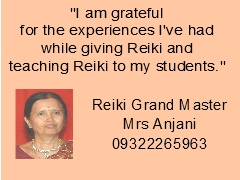 Mrs Anjani is a Reiki Grand Master. She is also an Astrologer. She has not only taught Reiki 1st, 2nd and 3rd Degree but also given Master Degree to many students. Many of her students are now teaching Reiki to others.